Bring your newly-obtained Dwarven artifact to Calcelmo in Markarth. Calcelmo wants to buy a Dwarven item from you. Buy a Dwarven item from a shop in a city. Receive the message from a courier. 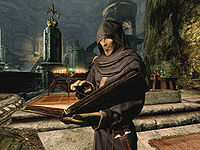 After purchasing a Dwarven item of any kind inside a city, a courier may come to you shortly afterward with a letter from Calcelmo in Markarth, saying that he wants to buy the item from you. Reading the letter triggers this quest. When you take the item to Calcelmo, you can sell it to him for twice the item's base value. If you succeed at a persuade (Speech 50+) or intimidate check, Calcelmo will offer two and a half times the item's base value. (Persuade) Passed: Well... I suppose important research is worth every coin. All right. You have yourself a deal. How's double and a half its value in trade? Not good enough. I'll shake the extra coin out of you if I must. (Intimidate) Passed: Hold on, there. I suppose, in the uh, interest of research... I can spare a few more coins. Double and a half its value. That's all I can muster. Enchanted and non-enchanted Dwarven apparel and weapons can trigger this quest. You can keep the item and complete the quest by agreeing to sell, immediately exiting dialogue, and then dropping your item before it is removed. If the item is dropped, sold, tempered, or enchanted the quest cannot be completed unless you find another, identical item (as stated in his message). This quest may be triggered multiple times. If you have two of the requested item and want to keep a specific one, trade the one you want to your follower then finish the quest as Calcelmo might end up taking the one you want to keep. As the price Calcelmo offers is calculated from the base value of the item (e.g., Dwarven gauntlets have a base value of 85 septims), selling an enchanted item through this quest can be a horribly bad deal. With the addition of Dwarven bolts in the Dawnguard add-on, Calcelmo can ask for any of the three explosive bolts discovered during the Ancient Technology radiant quests. Due to the way rewards are calculated, however, you will get an extremely small amount of gold for selling them to him. Calcelmo may not acknowledge that an item is in your inventory. Removing the item and getting it back again, such as dropping it and picking it up or trading it to a follower temporarily, may fix this. You may have to be in third-person view or the item could disappear when you drop it. If you have sold/lost the item, you can add it to your inventory through the console commands and it may be accepted by Calcelmo. If you have sold/lost the item, a forged/enchanted replacement may not be accepted by Calcelmo. Items that have been marked for the quest, but the courier has not delivered the note regarding, can be enchanted but cannot be named. ? The item Calcelmo requests may not be removed from your inventory when you are rewarded. The Execution Hood from With Friends Like These... is counted as a Dwarven artifact for this quest. The following empty quest stages were omitted from the table: 0, 100, 200, 255. On the PC, it is possible to use the console to advance through the quest by entering setstage WIAddItem07 stage, where stage is the number of the stage you wish to complete. It is not possible to un-complete (i.e. go back) quest stages, but it is possible to clear all stages of the quest using resetquest WIAddItem07. This page was last modified on 25 January 2017, at 00:32.